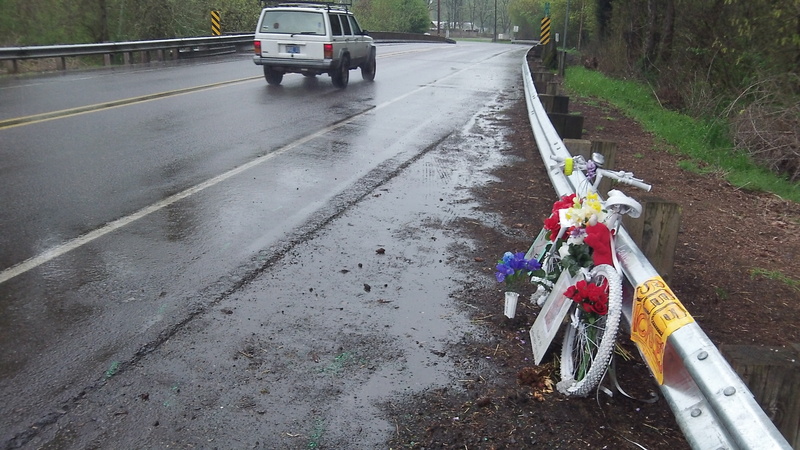 Traffic passes the roadside memorial for Grant Keith Garner on a rainy day last week. It’s going to take longer than expected to decide whether to charge the automobile driver in the cash that killed Albany bicyclist Grant Keith Garner on Feb. 17. That’s because the Linn County district attorney has been friends with the victim and his family, making it necessary to have the case reviewed by a prosecutor from another county. George Eder, senior deputy district attorney, told me about this development today. Linn County Sheriff Bruce Riley said last week that reports on the crash had been sent to the DA for a review of potential criminal charges. Eder confirned that he had the reports and said it was now clear that a prosecutor from another office would have to be asked to review them. He says DA Doug Marteeny knows the Garner family from church and helped counsel them in their grief after the death of their husband and father. This connection means an outside “special prosecutor” has to be appointed to remove any perception of impartiality from the eventual decision of whether or not to charge the driver. How long will this take? At least a month, Eder says. Garner, 60, was cycling home after work on Queen Avenue and Oakville Road when a 2000 Subaru coming from the south lost control on the Oakville-Queen corner and hit him. He died at the scene. The sheriff’s office identified the car’s sole occupant as a 24-year-old female from Corvallis by the name of Thanh Xuan Nguyen. Investigators said she was treated for minor injuries and was cooperating with the investigation. They found no sign of impairment on the part of the driver and said speed could not be ruled out as the cause. I’m sorry there will be a delay, but I’ve got to give the DA the credit he deserves for recusing himself from this investigation. Well done Mr. Marteeny, well done. Any conflict of interest issues had to have been known for at least 6 weeks. With “electronic communications:, such as fax, email etc. the documents could be sent to “another office” in a few minutes. With the documents available, i don’t see why it would take a couple semi intelligent lawyers from “another office” more than 20-30 minutes to make a decision and return the results. I’m not sympathetic to the driver, but she deserves to know what’s going on, instead of being “stuck in limbo” for months.